Left: Alex Honnold (top) and Tommy Caldwell climb The Nose of El Capitan in Yosemite National Park, Calif. At Right: Honnold (right) and Caldwell pose for a portrait at the top of El Capitan. Days after two of the world's most celebrated rock climbers twice set astonishingly fast records on the biggest wall in Yosemite National Park, they did it again Wednesday, breaking a mark compared with track's four-minute mile. Alex Honnold and Tommy Caldwell scaled El Capitan's 3,000-foot (915-meter) sheer granite wall in 1 hour, 58 minutes and seven seconds, Honnold said. The blisteringly fast pace capped weeks of practice climbs up the so-called Nose route that runs up the middle of the massive monolith towering above Yosemite Valley. It also came just days after two speed climbers fell to their deaths on El Cap. Honnold didn't think they were on a record time until he pulled his phone out and looked at his timer as he ran for the tree that marks the official finish line, he told The Associated Press by phone as he hiked down from the summit. 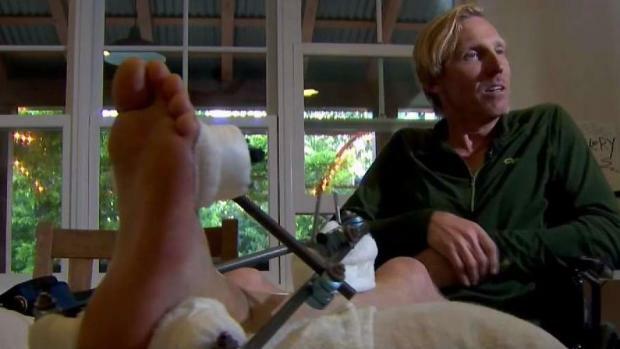 The East Bay rock climbing legend who survived a terrible fall last week on Yosemite’s El Capitan told NBC Bay Area the details of his harrowing and painful hours-long predicament. Terry McSweeney reports. "Oh my god, we're doing it," he thought to himself as he secured the rope around the tree and hoped Caldwell would hustle up the final pitch. "It was slightly emotional when we finished it. I had a wave of, `Oh wow.' I'm pretty proud we saw it through." The duo broke the Nose record three times in the past week, carving more than 20 minutes off a mark set last year. It would have been easy to stop after their May 30 record of 2 hours 10 minutes 15 seconds or Monday's mark of 2 hours, 1 minute and 53 seconds, Honnold said. Hans Florine, who has held the speed record for the climb on and off between 1990 and 2012 — the last time with Honnold — said the new mark is equivalent to the ongoing quest to break the two-hour marathon or Roger Bannister's 1954 achievement in the mile. "We were pushing the five-hour barrier before and then the four-hour barrier and then the three-hour barrier. So which one of those is the four-minute mile?" Florine said before the mark was broken. "I think it is getting close." Climbing times on El Cap have fallen precipitously since the first ascent of the cliff 60 years ago by Warren Harding and two others. That milestone took 12 days in a final push that followed 48 days of advance work over 18 months as Harding pounded bolts into the route to aid his climb. "As I hammered in the last bolt and staggered over the rim, it was not at all clear to me who was the conqueror and who was the conquered," Harding said afterward. 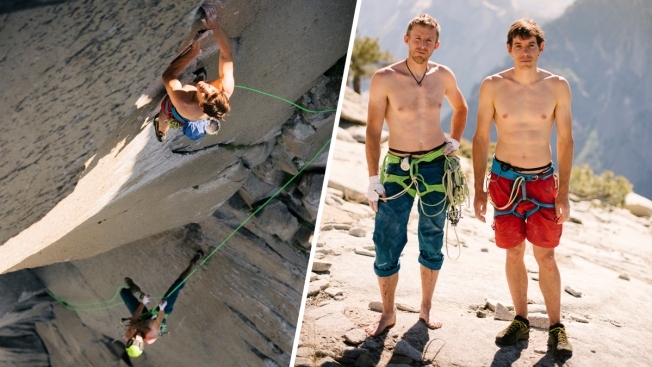 "I do recall that El Cap seemed to be in much better condition than I was." Yosemite is mecca for climbers around the world because of its vast array of beautiful soaring granite walls and peaks. El Cap, though, looms largest and offers 58 distinct routes. The Nose is the best known and typically takes accomplished climbers four or five days. Climbers jam their hands and feet into finger- and fist-width cracks to inch their way up the vertical wall. Ledges large enough to camp on offer respite, but sometimes there is little more to grasp or perch on than a sliver the width of a few coins. Other cracks come abruptly to an end in a sea of smooth granite, forcing climbers to swing 30 feet left or right to find the next hand or foothold. "It's a very complicated route," said Daniel Duane, author of the book "El Capitan: Historic Feats and Radical Routes." "It meanders all over the place and it has pendulum swings and bolt ladders and there are little variations where you can go this way and instead of that way, so there's a ton trickery involved in shaving off time." Speed can come with a devastating price. Climbers are roped together for safety, and they clip their lifeline into protective pieces that they place in cracks along the way to catch them if they fall. But the amount of gear in a race against the clock is pared to the bare minimum to save weight, and climbers sometimes move in tandem with neither anchored to the rock. The two expert climbers killed Saturday were speed climbing El Cap's Freeblast route in tandem when one fell and pulled the other 1,000 feet to their deaths, according to reports. Last year, Quinn Brett, a former women's speed record holder on the Nose, was trying to improve her time when she took about a 100-foot (30-meter) freefall and slammed a ledge below, leaving her paralyzed below the waist. Caldwell took 60-foot and 100-foot falls during the three weeks of practice runs and record attempts but was uninjured, said photographer Austin Siadak, who has been shooting video of the team for a documentary. "It was pretty scary because it was such a gargantuan fall," Siadak said of the larger fall. "I saw him hurtling upside down through the air and then bouncing on the end of the rope." But once Caldwell came to a rest, he quickly regained his composure, chalked up his hands and swung back over to a crack that he could climb back up. In 35 years of climbing, Florine's worst injury until this year was when crashed into a rock wall and knocked out a tooth. Last month, he was climbing the Nose in a day with a friend and took a short fall that broke both his legs and had to be rescued by helicopter. Florine, 54, has been at the forefront of chasing the speed record, but he noted that the fastest climbers are still covering just over 20 feet (6 meters) a minute. Sport climbers who sprint up short walls in competition can cover triple that distance in 5 seconds. Big wall climbing, of course, is another beast entirely. It takes a different type of endurance and composure to ascend 32 rope lengths with nothing but open air below. Honnold, 32, and Caldwell, 39, are arguably the biggest stars of rock climbing now with multiple accomplishments together, with others and, in the case of Honnold, on his own. Caldwell and Kevin Jorgeson earned fame outside alpine circles in 2015 when they were the first to climb one of the world's hardest route on El Cap, using nothing to assist their 19-day ascent and only ropes and gear to protect against a fall. Honnold holds the honor of being the only person to have climbed El Cap solo without a rope or any protection, a perilous feat that earned him widespread praise and also criticism for being reckless. The two climbers represent a sort of "dream team" from a generation who honed their craft in rock gyms and "are showing up in the outdoors with a radically different ability level than they used to," Duane said. With 400 rock gyms nationwide, the sport is open to people far from crags, boulders and other climbing features that were the only options a few decades ago, Duane said. That has created a broader spectrum of people being introduced to the sport. It's more likely to identify and develop those with a natural gift for climbing. High schools now offer climbing programs after school with expert instructors and hours of training each day. So even with climbers like Honnold and Caldwell setting new high marks, records are made to be broken. "At one level it's hard to imagine, gosh, how could anybody get better than those guys?" Duane said. "Yet sports move that way and they keep moving and they never stop moving. Climbing is a lot further along than it was 30 years ago on that curve toward athletic maturity. But I don't think it's anywhere near the outer limits."